Dubbed "The Needle" by his players from his stint coaching at provincial and international level, Fred Allen remains the All Blacks' coach with the best record, having coached the side during an unbeaten 14-Test run. Although he enjoyed a long association with Auckland, Allen was born in Oamaru and first played provincial rugby for Canterbury, going on to captain the red and blacks, and appeared for Marlborough and Waikato in 1944. During World War 2 he served in the 27th and 30th Battalions, playing for services teams and then for the famous 2nd NZEF "Kiwis" Army team which toured Europe after the war. He returned to New Zealand a star, representing Auckland and going on to captain the All Blacks. After the 1949 Tour of South Africa and 21 matches, including six All Blacks tests, he retired from senior rugby and started coaching. 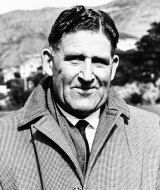 He was selector-coach of Auckland from 1957 to 1963 when the province established a then-Ranfurly Shield record tenure of 25 matches. An All Blacks selector during 1964 and 1965, he was coach from 1966 to 1968 when the team won all 14 tests played. At the 2002 rugby awards he was awarded a trophy for his outstanding contribution to New Zealand rugby. He was made an NZRU life member in 2006 and then knighted in 2010. As patron of the Auckland Rugby Union, Allen regularly attended Auckland and Blues rugby matches at Eden Park until his death in 2012.